Our Rejuvenis Magnesium Spray oil is from the Great Salt Lake and is carefully filtered and purified and meets or exceeds United States Pharmacopoeia (USP) standards to bring the consumer a crystal clear product that is safe. Although it feels oily it isn’t an oil, but instead was coined as such due to the high saturation of magnesium chloride which presents itself in an oil-like consistency. Magnesium Chloride is one of the best kept secrets. Magnesium is a mineral that is found in abundance in the body, however as we age it begins to decline. The role of magnesium in the body is so important that it is responsible for more than 300 chemical reactions that assist the body to function properly. We can get magnesium from our diet, but often times supplementation is necessary, especially in the elderly. Foods that are high in magnesium are high in fiber. Good dietary sources of magnesium can be found in whole grains, legumes, seeds and nuts and green leafy vegetables. Another wonderful source of magnesium is from water, yes, H2O, especially alkaline water from the Aging Younger Water ionizer. Low or deficient DHEA (dehydroepiandrosterone) levels are present in every illness, with few exceptions. 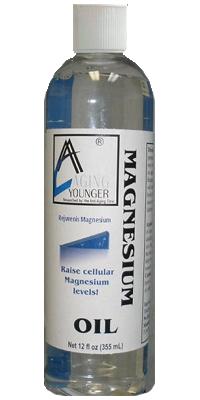 Rejuvenis Magnesium Chloride topical application balances DHEA in the body. The Magnesium oil is 31.1% Magnesium Chloride (see certificate of analysis). Our Rejuvenis Magnesium Chloride Oil contains 3182mg of elemental magnesium per fluid ounce. Two or three sprays under the arm functions as an antiperspirant as well as transporting magnesium swiftly through the thin skin into the lymph glands, lymph channels and blood stream for distribution throughout the body. Spray it on the back, hand, bend of knee and top of your feet any time of the day or night for continuous magnesium absorption. No matter where you apply the spray on the body, once it penetrates the surface of the skin, the body transports it to whichever tissues need magnesium most. Avoid direct contact with eyes or sensitive areas. If you experience a slight stinging sensation, simply dilute the affected area with water. Magnesium deficiency leads to an increase in myocardial levels of both sodium and calcium. This is a problem because Coronary Artery calcium is a predictor of near-term coronary heart disease events. In the face of growing magnesium deficiencies calcium becomes increasingly more toxic to human physiology. Calcium is essential to health yet it holds a hidden danger that brings us to our graves much quicker than we would like, with calcified plaque buildup. Calcium is the most promoted nutrient by proponents of conventional, nutritional, and alternative medicine. This is a great and tragic mistake. All in the wellness industry do however and doctors should as well, be promoting magnesium. If calcium is not taken with magnesium or it if it is not bioavailable, it will cause much more harm than good. Unabsorbed calcium can lodge anywhere in our body. For instance, if it lodges in your bones and joints, it mimics arthritis; if it lodges in your heart, it mimics arterial lesions. Calcification or calcium poisoning can manifest as heart disease, cancer, wrinkled skin, kidney stones, osteoporosis, dental problems, bone spurs, cataracts and many other health problems. Calcium deposits in the joints are called arthritis; in the blood vessels it is hardening of the arteries; in the heart it is heart disease, and in the brain it is senility. After decades of dairy industry marketing pushing calcium we have a situation that is literally killing millions of people and no doctor knows to lay off the calcium and start intensive magnesium treatments because of the big money behind the propaganda for calcium. Grocery Store purchased milk should be eliminated from your diet, not just because of the zero food value it has been reduced to via the processing of it, but also because of the high content of calcium, and because it has been transformed into being both a carbohydrate and a protein and the body does not deal well with the combination. The drug companies took advantage of these poor food combinations that create acid reflux and they got the FDA to say that acid reflux is a disease, which requires their little purple pills and over the counter pills such as things like Tums. When in fact it is not a disease, it is simply poor food combinations. You must consume protein first, before any carbohydrate. Anyone who wants to live longer should pay attention to the magnesium story and should immediately begin a strong and prolonged treatment with magnesium in its chloride form, called Rejuvenis Magnesium Chloride applied to the outer surface of the skin. Magnesium chloride is the most versatile, absorbable and effective form of magnesium and is applied topically from a spray bottle. It is the most perfect deodorant you can apply to your underarms and therefore, eliminates the dangerous aluminum and other toxins in chemical deodorant sprays. While calcium affects muscle contractions, magnesium balances that effect and relaxes muscles. Calcium tightens the muscles; magnesium relaxes the muscles. With insufficient magnesium the muscles stay tense and through the years may cause a cramp in the muscle. This could happen when you have too much calcium or too little magnesium. Too much calcium causes the heart to go into a spasm and it can’t relax. This is a heart attack. Get some magnesium into the body and the heart will slowly start returning to normal unless major damage has already occurred. Add iodine and selenium to your daily routine and we have the makings of an ideal formula to support recovery and possibly even minor tissue regeneration. Scientists are already creating heart patches made from seaweed and are seeing both blood and heart tissues growing and regenerating into the patches. Seaweed just happens to be high in magnesium, iodine and selenium. 1 Alternate ICP (Inductively Coupled Plasma Optical Emission Spectrometer) procedure used for detection of aluminum. 2 Aluminum limit revised for liquid with lower detection limit of 0.67 ppm. performance of the instrument…for accuracy, precision, interferences, and detection limits filtered through 1 micron filters. matrix….say 30% Magnesium chloride – that’s a whole different matter.